The church has the greatest story ever told: the message of the gospel. Unfortunately, most churches aren’t doing a great job of communicating it. The way the world communicates has changed dramatically in recent years. With the rise of the web and social media, many churches are in the dark about where to go or what to do next. Drawing on the wisdom and insight from over 60 leading experts in various fields of church communication, this book provides a comprehensive resource for church leaders sharing how the church can leverage new media to effectively connect people with the gospel. From branding and design, to websites and social media, there are endless ways your church can cut through the static and help the message of the gospel be heard clearly. We’ve got a message worth sharing. It’s time we learn how to communicate it and communicate it well. 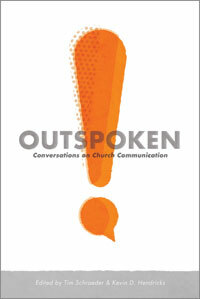 It’s time to be outspoken! Brad Abare, Jon Acuff, Maurilio Amorim, Jay Argaet, Ben Arment, Lori Bailey, Dawn Nicole Baldwin, Dave Blanchard, Phil Bowdle, Stephen Brewster, Dawn Bryant, Michael Buckingham, Kerry Bural, Josh Burns, Chad Cannon, Bobby Chandler, Phil Cooke, DJ Chuang, Jon Dale, Nathan Davis, John Dyer, Steve Fogg, Michael Forsberg, Drew Goodmanson, Jim Gray, Danielle Hartland, Kevin D. Hendricks, Scott Hodge, Blaine Hogan, Adam Jeske, Bianca Juarez-Olthoff, Matt Knisely, Charles Lee, Jan Lynn, Will Mancini, Vince Marotte, Cheryl Marting, Evan McBroom, Scott McClellan, Kem Meyer, Tony Morgan, Eric Murrell, Cleve Persinger, Jesse Phillips, Stephen Proctor, John Saddington, Jeremy Scheller, Tim Schraeder, Jennifer Schuchmann, Jeremy Sexton, Kent Shaffer, Curtis Simmons, Cameron Smith, Rhett Smith, Paul Steinbrueck, Tony Steward, Katie Strandlund, Leonard Sweet, Gerry True, Corbyn Tyson, K.C. Walsh, Denny Weinman, Justin Wise, Shawn Wood and Jason Yarborough. Learn more about how it came to be. Check out some snippets from throughout the book. See some of the initial launch buzz. Read an excerpt: Little Guys Can Do Big Things Too. Read an excerpt: Find Your Kimono.